Sri.Si.Pa.Aditanar founder of AEI was born in Kayamozhi on Sep 27,1907. In 1934, as a Barrister, he visited Singapore to practise law and earn the investment for his journalistic career. In 1948 he commenced THE DAILY THANTHI and revolutionized the field of journalism and created a far reaching impact on the society. In political arena too, Sri. 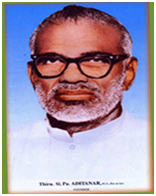 Si.Pa.Aditanar adorned the Tamilnadu Assembly speaker post in 1967 and later in 1969 assumed charge as a Minister for Co-operation and Agriculture. He established AEI in 1962, to uplift the rural masses by providing quality higher education in Arts, Science, Physical Education, Teacher Education, Engineering, Management, Medical & Paramedical science, etc. which are usually available in urban cities. He passed away in May 24, 1981. Padmashri Dr. B. SIVANTHI ADITYAN was a multifaceted personality with each facet representing the peak of achievement in different fields. He was a sportsman and sports administrator par excellence. He had been the President of the Indian Olympic Association for almost 10 years, held office in several International sports bodies. He was awarded the Olympic Order of Merit by the International Olympic Committee for his services rendered for the development of sports and education. He was a renowned industrialist, a newspaper baron of high repute, a dedicated educationalist and a quiet, unassuming philanthropist. He had been accorded the single honour of being appointed as the Sheriff of Madras for two consecutive terms. He was the Director of THE DAILY THANTHI and had rendered distinguished service to the Tamil language.He made an outstanding contribution in the field of education in the state. He established temples of learning in remote and inaccessible areas of the state. Today, thousands of young students who study in these institutions are living testimony to his commitment and dedication.In recognition of his service in the field of education, he was conferred with Honorary Doctorates by Madurai Kamaraj University, Annamalai University,Manonmaniam Sundaranar University , University of Madras & Tamilnadu Physical Education & Sports University. He was honoured with the award of Padmashri by the Central Government in 2009. PADMASHRI DR. B. SIVANTHI ADITYAN served in the Senate and Syndicate of four Universities, namely,Madurai Kamaraj University,Annamalai University,Bharathidasan University & University of Madras. He was also appointed as a member of the Planning Board of the Tamilnadu Dr. M.G.R Medical University and Manonmaniam Sundaranar University. •	Olympic Order of Merit by International Olympic Committee in 1995. •	Gold Medal by International Volley Ball Federation for his contribution to Volley Ball in India. •	Sports and Study award by International Olympic Committee in 1987. Sri. 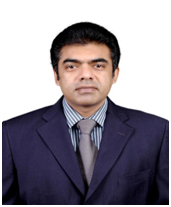 S. Balasubramanian Adityan is the Chairman of Aditanar Educational Institutuion and for the Institutuions run by AEI. He is the Director of "Daily Thanthi", "Daily Thanthi Private Limited", "Educational Trustee Company P Limited", "Metronation Chennai Television P Ltd", "India Cabs Pvt Limited", "Gay Travels Pvt Limited", "Sovereign Media Marketing P Ltd.", "Rani Weekly Pvt Ltd.", "Subasri Reality Pvt Limited", "Sivanthi Farms Pvt Limited", "Rukmani Publications P Limited", "Indian Newspaper Society" and "India Cements Limited.". He is a reputed educationist, a leading Industrialist and a Sports Administrator. He is the Advisor of "Malar Publications Ltd." which owns Maalai Malar-Evening Tamil Daily, "Air Media Network", "AMN TV", "Hello FM" and "Rani Printers". He took over as Executive Director of Malai Malar in 1990 and was solely responsible for the innovations and new concepts, enhances quality of content, Design, Layout and finally made Maalai Malar as the No.1 Eveninger in India. (1,65,000 copies). He is also the Vice President of Tamil Nadu Olympic Association.